Ottie’s father’s half sister Jessie Rynearson nee Marks’ daughter was Lucille who was a bit older than Ottie so I’m pretty sure this must be the girl for whom the party was given. 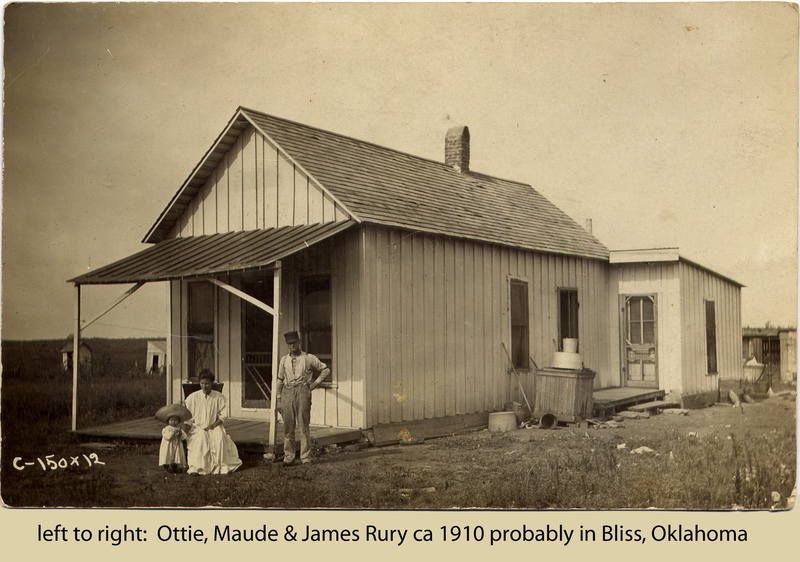 Bliss, Oklahoma was in the northern portion of Noble county for 26 years until its name was changed to Marland in 1924. The famous 101 Ranch included Bliss. The postcard below is of my Grandmother and her parents at, what I presume to be, their home in Bliss, Oklahoma. It certainly looks sparse around their house. 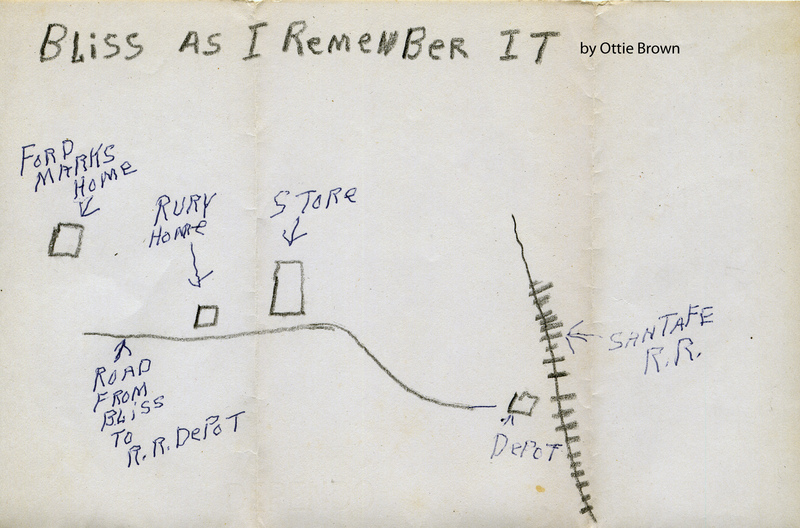 Late in Ottie’s life she shared recollections of Bliss, Oklahoma on a home video, which I transcribed below. She also provided a hand drawn map. One of the earliest memories I have is of the little town of Bliss, Oklahoma where I was born June 16, 1908. Now you may have heard some of these stories before but the earliest recollections I have is of Derry’s General Store. At Christmas time they had toys set out on tables and there was a little washer woman that you wound up…I was just fascinated with that toy but Santa Claus did not bring it to me. And then another time my father put a box on a sled with runners to go on the snow and I was holding my baby sister, Jessie, who was born on August 9, 1911. I was holding her in my arms and we were wrapped up down in this box and we were going up hill to my Aunt Jessie and Uncle Arthur Rynearson’s, cousin Lucille who was older than I was. And I remember that we tipped over in the snow and Mama just had a fit and she scolded Papa for letting us tip over in the snow but we were soon wrapped up and on our way again. And then Clark’s Hardware was who my father worked for and he installed guttering around the roof of a 2-story home that belonged to a Jakely’s and they were a German couple and they had a boy, Frank, and twin girls one of them was named Ida and then they had a little girl that they called Babe. And one time this German man, Mr. Jakely, was bringing some beer to my father and mother’s and he had it in the back of his buggy. When he got to our house the beer had…uh then they had put corks in the bottles and wrapped wire around these corks to hold them in but it was hot summer time and the corks had come out and all he had was of foam in the back of his buggy. The beer had all disappeared by then. Update: For more of the story read the comments on this post. Cool post – on the first link, Cherokee Strip Museum – one of the pictures is of the H. L. Derry General Store. Another of the pictures is of the Hardware Store – one photo seemed unnamed while the other one clearly is Clark’s – where her father worked. How old was Ottie when she moved from Bliss? Her memories were obviously quite accurate. If her map is accurate, then their house, above, would be just to the left of the photo of the unnamed hardware store (1st picture). Note also that the date of the party was August 1st (or 7th), 1911 and Ottie mentioned that her sister, Jessie, was born August 9, 1911 – so Maude would have been quite pregnant on the day of the party and perhaps even unlikely to be able to accompany Ottie to the party if Jessie and Lucile lived very far away. 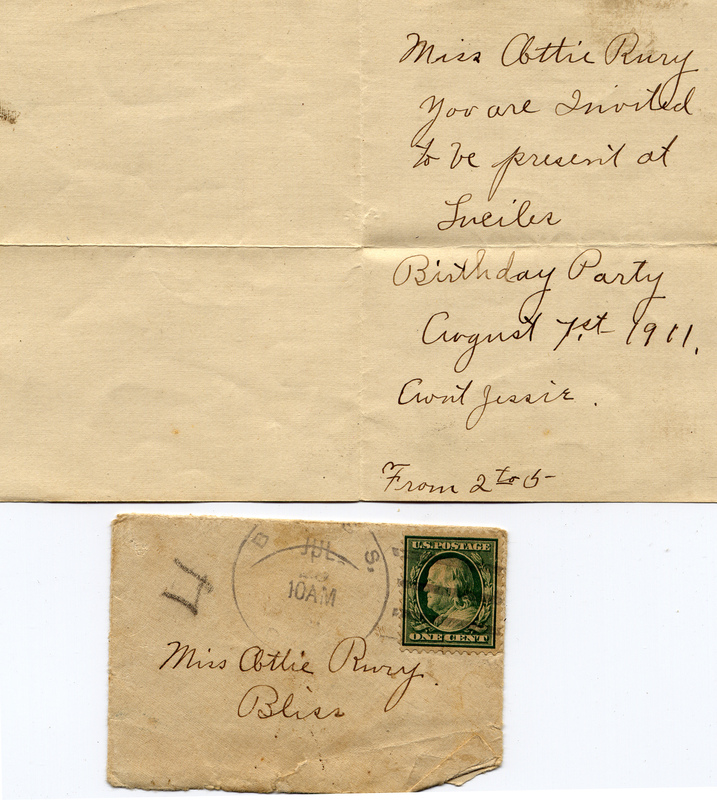 You might note the spelling of Lucile’s name on the invitation – it’s missing the typical second ‘l’ in Lucille. You mentioned the maiden name of Jessie as Marks. Ottie’s map shows the house on the left to belong to Ford Marks; is that a relative of Jessie and/or James – even perhaps a stepgrandmother to Ottie? Yeah, I thought those vintage photos showing what Grandma talked about were great. I wish they were bigger. Depending on the scale of the map, the store could have been close or several block equivalents away. I noticed that Grandma’s sister was born near the birthday party date as well and wondered how Maude was getting around at that point. I feel sure that I have photos of the Rynearson’s because Grandma talked about them a lot. Unfortunately, they are not identified yet. It does look like there is only one ‘l’ not a double ‘l’ in Lucile’s name but it’s hard to read other letters in the invitation and I’ve seen it spelled the standard way in another family document. It’s an important thing to remember in looking for more information about her. Ford Marks and Jessie Rynearson nee Marks were full siblings and James Rury was their half brother. Grandma was always specific in indicating that they were her father’s half siblings probably because the were also 10-16 years younger than her father. She did proudly refer to them as her aunts and uncles. According to Grandma’s stories they moved to Waurika, where she has very few memories, and then to Ponca City, which she talked about quite a bit. In 1913 they moved to Guthrie and stayed there until they moved to Enid in 1922. So they probably moved from Bliss a short time after the birthday party. Clearly, the most she could have lived in Bliss was the first 5 years. To have only lived there for the first few years of her life, her ability to have recalled the physical arrangement of the town is amazing.